Hit the road yesterday morning around 8:30am. We were trying to make it to Marquette by 2:00pm, having planned a hike with our couchsurfing host Joy when we got there. Had no problems making it out of Duluth on a Sunday morning. Hardly any traffic at all. Our route took us through some areas where we would have liked to stop and do some more exploring, but unfortunately we are on a bit of a schedule with this trip. We'll have to return with the motorhome someday and take our time. 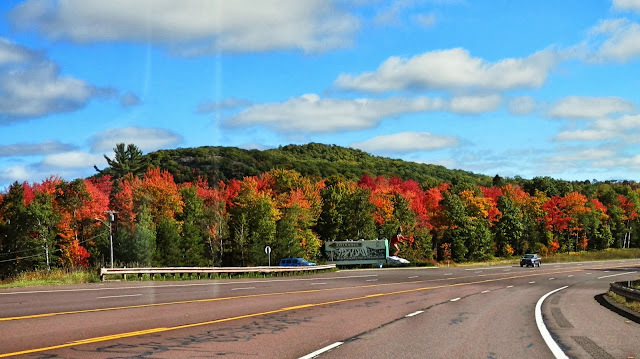 Taken through the car windshield, there are some trees starting to show their fall colors. 265 miles (427 kms) from Duluth to Marquette. Only one problem with our plan. We forgot about a time zone we were driving through! A few miles after we crossed the Michigan border, we entered Eastern Time and lost an hour. So instead of being 15 minutes ahead of schedule, we were all of a sudden 45 minutes behind schedule! We stopped at a little gas station and the nice lady let us use her phone to call Joy and let her know we screwed up on our anticipated arrival time. No problem though. 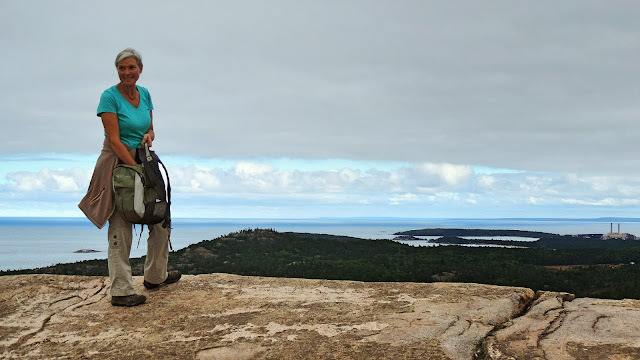 As soon as we arrived at her place, we took off and picked up a friend of hers and drove to a hiking spot called the Hogback Mountain Trail. Ruth, at the top of Hogback Mountain. Joys daughter has a dog and we had taken Ayza with us. She's a one year old Australian Shepherd and a really nice dog with boundless energy. Joy goes to a tiny little local brew pub on Sunday nights. They have a small band playing and it's a popular spot. So we went with her for an evening out. It was lots of fun and something we haven't done for a long time. Good beer too! Today, we're on our own as Joy is off to work. So we'll go explore downtown, plus she's given us directions to another hiking area nearby. So great to finally be out exploring again!!! I bet your bodies were glad to have you out hiking and moving around again. Those small local pubs usually are the most fun. I think our bodies were really happy to be out hiking again. Lovely fall colors. Good thing you remembered about the time zone as Joy would have started to worry about where you were. I am sure she would have worried or she would have been upset with us for making her wait by being late and not calling. We are glad we remembered! Good hiking can release all those muscle kinks from sitting in the car. Have fun. It sure can, and it worked great on our tired muscles. Nice fall colors. We are behind in colors here in southern Wisconsin. We leave in two weeks and no color yet. Sure hope we see some before we leave. This is my favorite time of year! In areas it was nice and then in other areas there still wasn't much colour, it certainly isn't at it prime yet! Beautiful scenery and a nice view from the top. I imagine that it felt good to get back on the trail. BIG lake cruisers and then get off at Ottawa; save a bunch on gas !!! Hope all goes well and the HAPPY DAYS follow y'all !!!! We go crazy with all these time zone changes. Now that we are in Mountain Time, I have to keep remembering to call my dad before 7 pm our time because he may be in bed in Eastern Time...egads! Forget to say that I love the header photo. Awesome. Be careful driving across the Mackinac Bridge tomorrow. That bridge likes to hurl little blue cars into the waters below. What a beautiful header picture. Fall colors were just beginning in Yellowstyone this morning. The Aspen...beautiful. Did I get a photo? Nope.....Mackinac Bridge is a neat experience!